Lama Zopa Rinpoche at Maitripa Institute, USA, November 2007. Rinpoche has been teaching at the Kopan one month meditation course. Rinpoche will then teach at Root Institute, Bodhgaya, India from Dec 24 – 27 and give Great Chenrezig initiation on Dec 28- 29. We previously advertised that Rinpoche would visit Mongolia and that EEC 5 would be in Mongolia in August-September 2008 – this is now cancelled for 2008. The next CPMT meeting will be April 26th – May 2nd 2009, hosted by Institut Vajrayogini, France. CPMT will be followed by a 3-4 week retreat with Lama Zopa Rinpoche also at Institut Vajrayogini – more information about CPMT and the retreat to come in 2008. We regularly add Lama Zopa Rinpoche’s advice to the Advice section of Rinpoche’s official homepage. Rinpoche reading Panda Bear’s letter. and to feel the wind blowing in your face with your mum in the car and also that you are able to go to the Resource Center for Non-Violence. My dear Panda Bear, if you realize that everyone loves you now, this means that this result came from your past karma, you must have loved others. This is what is called “karma” or “cause and effect”. So all the love you are receiving now from others or when your mum is looking at you is from your past karma. Here I am sending you my best gift, this is not an object of the senses, such as smell, taste or touch. But this is for your ears, for you to listen to. Here I am sending you some songs, liberating and enlightening songs. By hearing these songs of loving kindness, your life will always get better and better up until the highest happiness, the ultimate full, peerless enlightenment, complete bliss, which is called the completion of the spiritual path, that includes total liberation from the whole entire sufferings of the different realms, including the human realms, the animal realms and all the other realms, such as the hell realms, hungry ghosts, sura and asura, intermediate state beings and worldly gods are all purified. So here I am sending you some CDs to listen to (maybe your mum can play them for you to listen to). Also here is Maitreya Buddha mantra and Medicine Buddha mantra so if your mum can chant this in your ear, best if she can recite it loudly in your ear. Actually your mum can do this for all the animals that she finds. If she can recite these 2 mantras for you everyday, it would be great! This is because this is what can bring you closer and closer to total liberation, from all the sufferings and the causes, which is where all the karma and delusions come from. This is what can bring you to perfect, blissful, enlightenment. 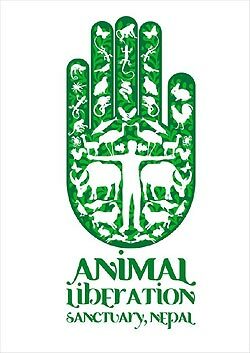 This would be you best gift for all the animals, the most beneficial things for them, also this is most beneficial for your mum, her most beneficial service. 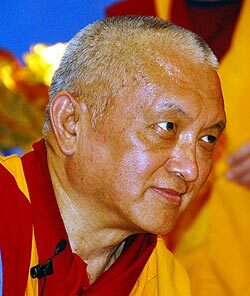 Geshe-la had been the active and beloved resident geshe of Istituto Lama Tsong Khapa since 1980, serving Lama Thubten Yeshe and Lama Zopa Rinpoche, and was the teacher of the first FPMT Masters Program. Ven. Joan Nicell kindly sent out reports of Geshe-la’s passing and cremation. 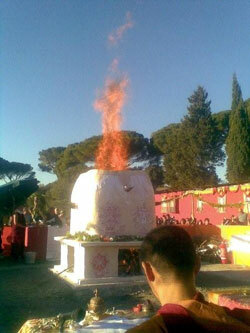 Geshe-la’s body was cremated at Istituto Lama Tsong Khapa on Lama Tsongkhapa Day. Bringing the total number of FPMT centers, study groups, projects and services worldwide to 152! Jamyang Study Group in France has closed. Thanks to all who helped the group. Warm holiday greetings from us to you! This time of year at Mandala, the work of the FPMT family enters our minds in a particularly special way. How grateful we are for all that you do and for who you aspire to be in the world. Perhaps your minds are filled with gratitude for all that your friends and family do for you too. We’d like to suggest a Mandala subscription as a gift to say ‘thank you.’ This gift will help them enjoy our vibrant lineage of teachings and your support of Mandala will help us continue to serve our FPMT community and the world under the guidance of Lama Zopa Rinpoche. Please subscribe now at fpmt.org/mandala/subscribe/. The deadline to make sure your friends receive the February issue is December 24. Many thanks to Ven. Amy Miller, who generously offered her time and recorded Buddhism in a Nutshell for us recently in Nepal. Heather is busy editing these recordings and preparing materials for a homestudy version of this program. Look for it in the next couple of months. Great news! 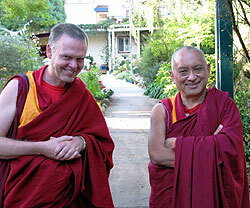 FPMT Spain is planning to produce a Spanish version of the Discovering Buddhism at Home program. Also, when the English programs are finished, FPMT Spain will be making Spanish Buddhism in a Nutshell and Meditation 101 homestudy courses. Rinpoche and Vajrapani Institute’s resident teacher, Ven. Rene Feusi, USA. We hope all teachers, center directors and spiritual program coordinators saw our recent message with compiled key advice from Rinpoche – those with access to the FPMT Affiliates Area can refer to it here. you can include that in your work with students. We recognize that center directors and spiritual program coordinators need this information at their fingertips also. This is a rough transcript of a conversation I listened into recently, and it got me thinking about the role of our individual consciences in our daily practice and our path to full awakening. Hope everyone finds it interesting and thought-provoking – and if anyone feels like joining in the debate, please send your comments here. The next BEL newsletter will be out soon, so do subscribe if you wish to receive it. A. So, as a Buddhist, have you given up flying because of the effect it is having on climate change and the harm to living beings? B. Oh, of course not – we can’t possibly go back to living in a primitive way! I could not imagine life without flying. I hope somebody will find a way to ameliorate the bad effects, but I don’t feel it’s my responsibility. C. (addressing A) Why would you expect Buddhists to be any better than any other religion? There are people from all religions carrying on with daily activities that contribute to climate change, that they could reduce but don’t. Why should Buddhists be any different? A. Many Buddhists I met in the East were very careful about harming other beings – so I suppose it left a kind of expectation. The main thing about most religions is believing in their particular God, so you’d expect them to be a bit hit and miss about a particular focus on anything beyond that, even though there is a common theme about love and compassion, etc. BUT – The heart of Buddhism is about developing awareness of interconnectedness and compassion, and understanding and ‘subduing’ (to use the jargon) one’s own mind. Put those things together and you can’t avoid seeing the need to avoid harming other beings as much as possible. So yes, of course human nature wants to have all its consumer goodies AND feel lovely and spiritual as well – but if the teaching and practice is doing its job, then that bit of human nature will be transformed. And if it isn’t transformed, then surely the teaching and practice isn’t doing its job – and if that’s the case then surely anyone who cares about the Dharma will want to find out why and sort out whatever gap has been left in the process. I feel it is doing sincere students over here a disservice to be encouraged to think that just because they are meditating and thinking beautiful thoughts they don’t have to actually change what they do day to day. Anyone wishing to join the debate – get your thoughts in the next issue! As requested by Lama Zopa Rinpoche, and with help from Beth Simon, our Golden Light Sutra website is encouraging students to recite the Sutra, collecting numbers recited, gives an explanations of the benefits, and experiences of those reciting the Sutra. Many thanks to Center or Spiritual Program Directors for organizing group recitations! Please be sure report them and include the total number of completed recitations of the sutra. Mani visits Rinpoche at the California office, USA. Excerpt from a thank-you letter to Rinpoche from Bob Charlton, SPC of Jamyang Buddhist Centre Leeds. “I would like to thank you from my heart for the opportunity you gave us to hold the Maitreya Project Heart Shrine Relic Tour here in Leeds, England. Many non-Buddhists were walking around the statue, being blessed and coming into contact with these rare, powerful, holy objects. It was overwhelming to observe. Young girls were spending time writing out the Sanghata Sutra, people were coming off the street without any prior knowledge of the event and were emotionally overcome. The range of nationalities, gender, age and race was extensive. It was wonderful. 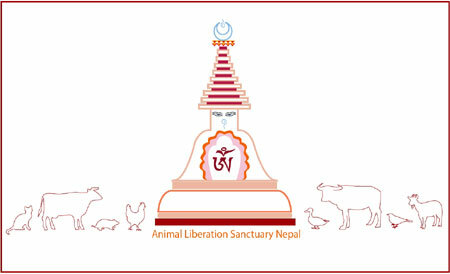 The Animal Liberation Sanctuary project is pleased to announce the results of the t-shirt design competition. We received many fantastic entries from around the world. The winning design is Kennedy Kok from Singapore. Kennedy’s design will be used on t-shirts and other merchandise we hope to produce in the future to support the project. The other winning entry comes from Ella Humphreys, Australia. Ella’s fabulous design will be used as the general project motif. The ALS Coordinators (Phil Hunt and Tania Dubrovnic) would like to thank everyone who submitted an entry and helped raise awareness of this important project of Rinpoche’s. New opportunities include Health Project Manager at Shakyamuni Buddha Community Health Clinic, Root Institute, India.